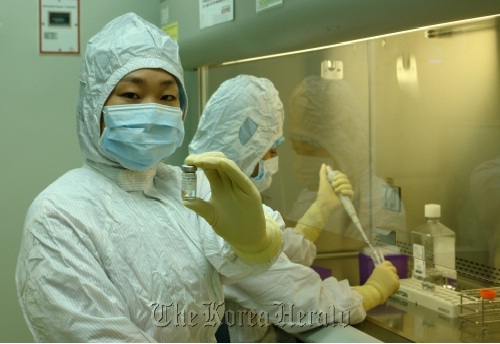 Korea’s biotech companies have increased their research and development spending by 13 percent in 2011. According to a survey conducted jointly by the Ministry of Knowledge Economy and the Korea Biotechnology Industry Organization on 100 biotech ventures in Korea, the companies have made a combined investment of 643.7 billion won last year, up 12.6 percent from the previous year. In particular, the investment in the biosimilar and medical equipment areas has jumped 26.5 percent. The total output and employment within the industry have been 5,572.6 billion won (6.6%) and 17,352 (8.0%). The ministry and the industry association will make a larger-scale survey on 987 biotech companies and publish the results before the end of this year. In the meantime, the ministry will nurture the fledgling industry by providing crtical information on technology and market opportunities. Source: The Korea Economic Daily. Soaring research costs, rampant illicit rebates and a gushing inflow of multinational drug giants following free trade pacts have come together to ignite the biggest crisis in years in Korea’s pharmaceutical industry. Heaping further pressure is the government’s push to slash drug prices and its sweeping crackdown on unfair trade practices, as well as economic uncertainties stemming from Europe. To tackle the daunting challenges, local drug makers crafted a two-pronged strategy this year: Bet big on research and development, and jump on the biomedicine bandwagon. Generic manufacturing has long been a major source of revenue for most Korean pharmaceutical firms. That heavy reliance and their weak overseas presence caused them to shirk from drug development as it costs huge amounts of time and money with no assurance of success. Reckoning the need for long-term growth strategies, however, a surging number of companies are stepping up efforts to reinforce their pipelines eyeing international markets. Dong-A Pharmaceutical, the industry frontrunner, aims to make global inroads this year by cultivating novel products and raising exports to half of its sales. Green Cross, a leading vaccine producer, will notch up its R&D spending to 10 percent of revenue from 7 to 8 percent. It set a goal of posting 2 trillion won ($1.76 billion) each in domestic and overseas sales by 2020. Tired of long waits at the hospital for medical tests? If Korean researchers have their way, your smartphone could one day eliminate that – and perhaps even tell you that you have cancer.A team of scientists at the Korea Advanced Institute of Science of Technology (Kaist) said in a paper published in Angewandte Chemie, a German science journal, that touch-screen technology can be used to detect biomolecular matter. “It began from the idea that touch screens work by recognizing the electronic signs from the touch of the finger, and so the presence of specific proteins and DNA should be recognizable as well,” said Park Hyun-gyu, who with Won Byong-yeon led the study. The touch screens on smartphones and tablet computers work by sensing the electronic charges from the user’s body on the screen. Biochemicals such as proteins and DNA molecules also carry specific electronic charges. According to Kaist, the team’s experiments showed that touch screens can recognize the existence and the concentration of DNA molecules placed on them, a first step toward one day being able to use the screens to carry out medical tests. Five researchers, clad from head to toe in sterilized surgical attire, assiduously prepared for a stem cell transplant, extracting from the blood of an umbilical cord and implanting the cells into an 80-year-old patient with cerebral palsy. According to medical experts, one of the first signs of improvement in patients suffering from cerebral palsy after stem cell treatment is an increase in muscle tone, often followed by improved vocabulary, socialization and logical comprehension. 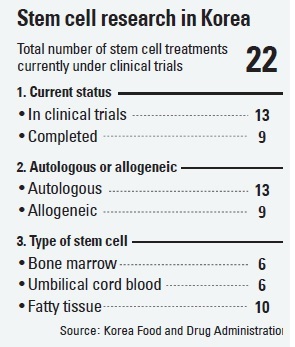 Operating rooms of the medical center’s stem cell clinical trials center are designed to allow for the quick transference of stem cells extracted in laboratories to patients undergoing surgery. According to Chung, the CHA Medical Center is the first facility to adopt such a design, and others may follow suit in the near future.